Hawaiian Transient State Tax 14.42%, not included. One-time cleaning fee between $95-$145 based upon the length of your stay. There is an additional $45 charge for late arrivals after 6p.m. – 10p.m. and $65 from 10p.m. – 11p.m. No check-Ins after 11p.m. $35/night per night per additional person. Please use the driving directions instead of online or GPS maps; they are not accurate. See our website for more details. It can get a bit complicated without detailed instructions. 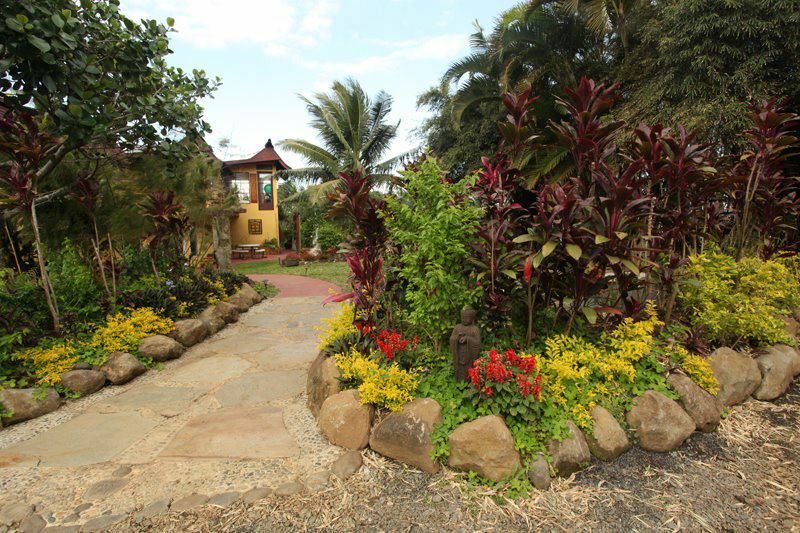 Whether you're seeking sanctuary, looking to write the next chapter of your life or are simply on vacation, come explore sustainable living at Maui’s premier eco-retreat. Hosting conscious eco-travelers, as well as people from all over the world who come to study the art of Embodied Spirituality and Sustainability. Surrounded by sacred temples and nature retreats, it truly is a piece of paradise. All accommodations are built with extreme environmentally conscious design and architecture in mind. With a main house (Opua House) that is home to multiple themed rooms and multiple private residences, this is an amazing way to experience the Hawaiian Islands and eco-tourism. Holiday season, mid-December to mid-January. High season, mid-January to end of March. The bamboo ceiling features a rooftop, prism-shaped window that crowns the centerpiece of the room—the bed. From the bed, you can gaze upon the stars at night or watch the sun rise over the ocean. This incredibly romantic shelter, which features a full kitchen equipped with a gas stove, huge closet and very private outdoor shower, is the perfect place for honeymooners from around the globe. Come celebrate your new adventure or find peace and solitude in this rejuvenating and ground-breaking haven. Truly a place where nature is honored and your eco-soul can relax. Intricately carved Balinese doors begin your journey from path to house, as the eye catching roofline, inspired by Thai temples, presents itself. Built entirely of renewable bamboo, this abode is so unique that even before construction was completed it was featured on the prestigious German travel show “Reiselust” ("Wanderlust"). Decorated with elegant furnishings, porcelain, and stained glass, the Thai Hale has a sleeping loft with a queen-size bed and meditation corner, as well as a small single bedroom on the first floor. The Thai Hale comes equipped with a full private kitchen and bathroom. The underwater themed outdoor shower, designed by an award-winning artist, overlooks the ocean and takes “sensuous bathing” to a whole new level. The wrap-around lanai provides an outdoor living area with couches, tables and chairs and a view of the Thai Hale’s beautiful garden and the sea. Truly a place to enjoy nature with pure, clean water from our well, fresh air and sacred soil where our Thai Hale is built with respect toward mother nature. The Main House is composed of four rooms. Rooms have shared bathrooms available either on the same level or a level below or above. The main house has a community kitchen where guests can cook their own meals. It is fully stocked with just about everything you would need in a kitchen. Take advantage of the social time and eat too! Bathroom facilities vary. The main house with guest rooms share bathrooms. But the most popular bathroom facility is the private outdoor shower next to the temple—a truly amazing expereince.